As always, I would like to start off by stressing that whilst I have made every effort to ensure the information is correct, I cannot be held responsible for any errors or omissions, or for the results obtained from the use of this information. All information on this site is provided "as is". See our Disclaimer. To remove burnt-on food from the bottom of the oven, coat with a thick paste of bicarbonate of soda and water, leave for a couple of hours and then clean out the debris. Repeat if necessary. In an emergency, leather shoes can be cleaned and polished using the inside of a banana skin. Also works a treat for putting the gloss back on large-leaved houseplants, such as rubber plants. To unblock a drain or sink, mix a cup of bicarbonate of soda, a cup of salt and a cup of vinegar and pour the mixture into your drain or down the plughole. Leave for half an hour, then rinse with a kettle full of boiling water. Polish brushed steel with a few drops of baby oil. To remove stale or cooking smells when it’s too cold to open a window, simmer a cinnamon stick and a few cloves in water. Your house will smell good enough to eat! Apply a light layer of baby oil onto clean shower doors to keep them crystal clear for weeks. For an inexpensive way to keep scum and grease at bay, make a solution of 1 part surgical spirit (rubbing alcohol), 3 parts water and a dash of liquid cleaner in a spray bottle and apply after every shower – no need to rinse. If you are not going to use your dishwasher for a few days, just toss in a couple of tablespoons of bicarbonate of soda to stop musty smells. 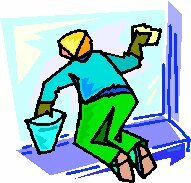 For window cleaner, put half a litre of water in a spray bottle with 4 tablespoons of vinegar and 2 tablespoons of lemon juice. Spray onto crumpled newspaper and use to clean windows. Use a couple of drops of odourless cooking oil or baby oil to cure squeaky hinges or sticking curtain or shower rails. To clean grout, mix 1 part white vinegar with 2 parts bicarbonate of soda to make a thick paste (or use a cheap toothpaste). Spread the paste on and leave for a couple of hours or overnight before scrubbing off with an old toothbrush. For an odourless fridge cleaner, use a teaspoon of bicarbonate of soda in 300ml warm water. To remove lime-scale, use neat lemon juice or white vinegar (but do not use on plated taps). For encrusted areas, soak some cotton wool in lemon juice or vinegar and wrap round the tap, covering with a plastic bag secured with a rubber band. Leave overnight and remove by scrubbing with an old toothbrush. Water stains in baths can be removed with a paste made from white vinegar and salt spread on and left overnight. To make a grime-busting solution, mix 2 teaspoons laundry borax, 2 tablespoons white vinegar and 2 cups warm water in a spray bottle. Add a few drops of essential oil, or a little disinfectant for bathroom use. 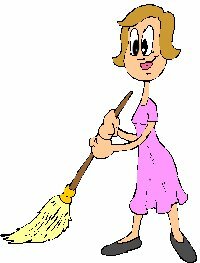 To clean floors, use 3 tablespoons of white vinegar or a couple of tablespoons of washing soda in half a bucket of hot water. You can quickly fragrance a room by spraying a little cologne or perfumed furniture polish onto a light bulb (before you turn it on) or a hot radiator. Laundry borax (not the same as boric acid!) can be used as a water softener or, dissolved in water, as a disinfectant. Bicarbonate of soda (perfumed if you like by mixing with some talcum powder or a couple of drops of essential oil) can be used to freshen carpets – sprinkle on and leave for an hour or so, then vacuum out. An effective marble cleaner can be made from a paste of bicarbonate of soda and lemon juice. Scrub over surface, then rinse. Leave paste on any stains for 30 minutes before scrubbing. Test on a hidden area first as the acid from lemon can damage some marble finishes. Clean a narrow-necked vase by dissolving a soluble aspirin or a denture-cleaning tablet in some water in the vase and leaving overnight. Add a couple of tablespoons of uncooked rice, swirl around vigorously for a minute or so, then rinse. A teaspoon of bicarbonate of soda or cream of tartar added to the powder drawer will make a white wash whiter. A ring in your toilet bowl can be removed with a paste of laundry borax and lemon juice. 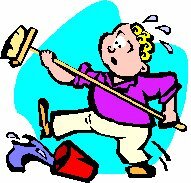 Swish away some of the water in the bowl with a toilet brush, so that the water level is below the ring. Apply the paste, leave for a couple of hours or overnight, then scrub off. To make room freshener, put a few teaspoons of bicarbonate of soda in a decorative bowl, add a few drops of essential oils and put in an out-of-the-way place. Other inexpensive, environmentally friendly, cleaning tips.